E2 reactions occur quickest when the H-C bond and C-LG bonds involved are co-planar, or as close as possible to 180° with respect to each other. This is known as an antiperiplanar conformation. This conformation positions the sigma bonds being broken in the proper alignment to become the new pi bond. 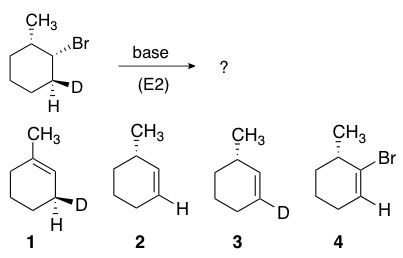 First, determine the lowest energy chair conformation required for reaction, where the LG is axial and any other large groups remain equatorial. Once determined, two pathways must be considered (highlighted by the axial proton and deuterium below). 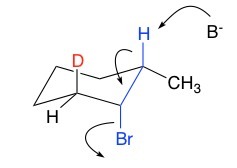 Removal of the proton provides the more stable tri-substituted double bond (recall Zaitsev’s rule) and therefore is the preferred pathway.